The non-act of not writing about and posting my clumps has, itself, now become a clump. When many days of not posting slip by and accumulate, the psychic build-up is akin to the massive ironing pile documented as clump #26. Ironically, my ironing pile is under control, but ironing-related posting material coming into my consciousness is piling up. I should be off the ironing subject but I can’t let it go … so I’m blocked, like steam trapped behind mineral deposit build-up on an iron (sorry). You know the phenomenon of getting something in your mind and then seeing that thing over and over in the world? Here’s a sampling. 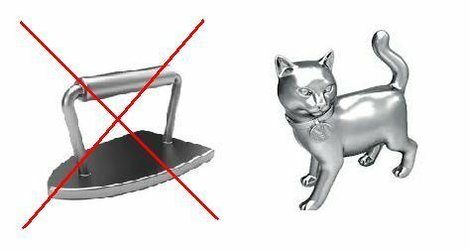 Hasboro, the maker of the game Monopoly, recently ditched its iron-shaped game piece for a cat-shaped one. More than 10 million Facebook fans from over 120 countries voted the “depression-era iron” off and the cute kitty on. I feel this is an important cultural moment. Apparently the niece of the game’s inventor suggested using the charms on her bracelet for the game pieces. Would a girl today have an iron on her charm bracelet (do girls still wear charm bracelets?)? Ironing is an endangered act, what with wrinkle-free fabrics proliferating in the marketplace. 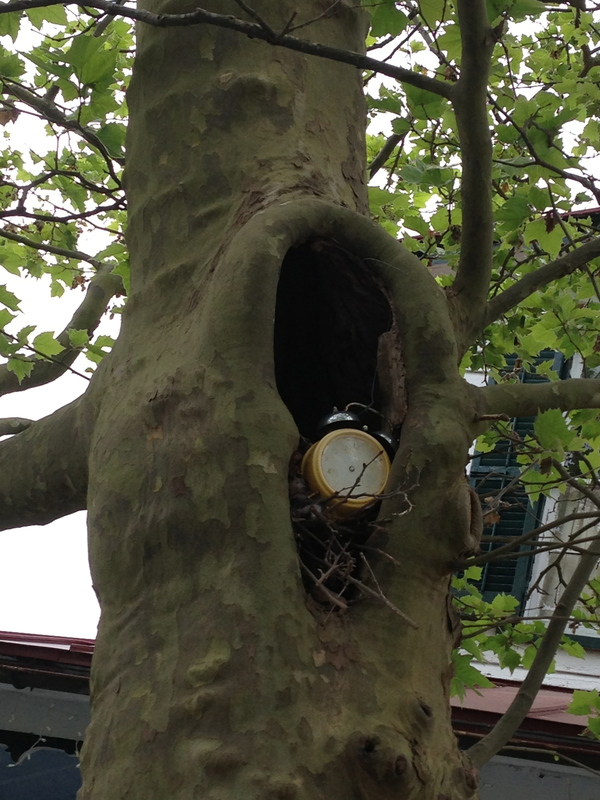 Was it once part of of a woman’s domestic or female arsenal of charms? Stephan Pastis, creator of one of my favorite comic strips, Pearls Before Swine, http://www.stephanpastis.wordpress.com, had a good time with this in a series back in April. I guess what I’m struggling with is the fact that I’m a throwback to another time. When I list my occupation on the various forms we’re all required to complete, I’m in the habit of writing Homemaker. It’s a title that calls to mind Donna Reed or June Cleaver. Now that my children have more or less grown up and away from home, the full-time mother part of the role is not as much the point of pride it used to be. So maybe on some level I enjoy the drama of a monstrous ironing pile, since vanquishing it gives me a visible sense of accomplishment. See what I did?! Which brings to mind another comic strip, Mutts, by Patrick McDonnell, http://www.muttscomics.com. 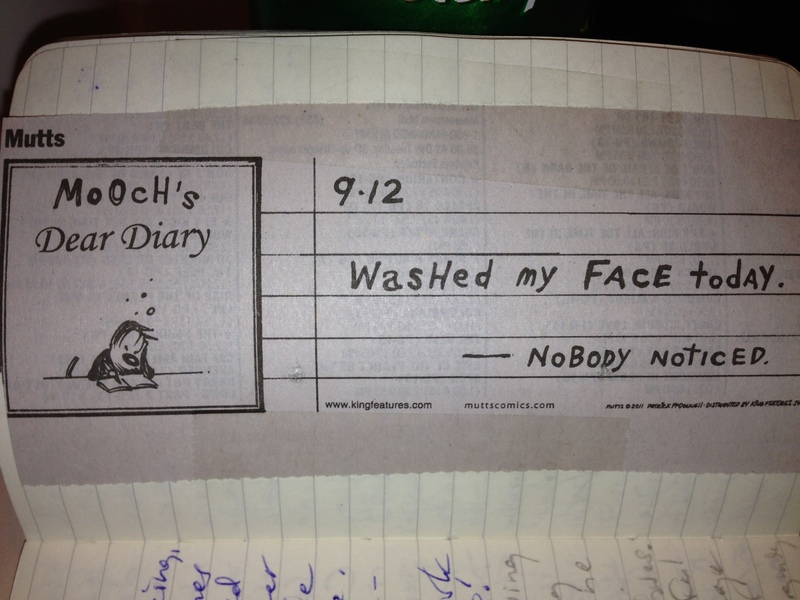 I had taped this in my little book of random notes on 9/12/11. On the facing page I had written, “The better a housekeeper you are, the more invisible your work becomes.” Hmm. And … we’re back to a cat again, an animal Monopolizing the internet, but not necessarily know for its work ethic. Next Post → Tear Down This Wall!